In the midst of my Star Wars Easter weekend, I’ve managed to make some room for more DC greatness as well, more comics and TV series, and the news coming out of WonderCon about the new Rebirth event coming this summer! You may remember, back when I read the Batman event comic, Night of the Owls, I was particularly impressed with Batwing? Well, I bought the first issue of his ongoing series and read it a couple of weeks back. The Lost Kingdom deals with Batwing on the trail of Massacre, a villain who has been trawling across Africa killing off members of the super hero team called The Kingdom. This team had come together in the recent past to fight against the injustices being done to the continent, but had gone into retirement. Batwing fails to save a couple of members, so decides to try to get ahead of Massacre by learning where the remaining members of the team are before the crazed Massacre can get to them. Along the way, we learn through flashbacks about the early years of Batwing, otherwise David Zavimbe. It’s a really interesting comic, particularly because, while I was aware of the character, I knew nothing about him. While I can’t claim to be an expert on the subject matter, I thought the Africa-centric storyline was handled in what felt like a mature and sensible manner. I’m sure there’s a lot more that can be said on that, but if nothing else, I thought it was really interesting to see a comic book set somewhere other than America. There’s also a tremendous sense of history that comes out of discovering who this super hero team were, which is remarkable given this is an entirely original story! I finally got round to volume two this weekend. In the Shadow of the Ancients picks up right where volume one left off, and I’ve read some criticism of the split here, as the storyline isn’t resolved until this book, leaving the first part a little disjointed. Though it made me buy the second book without thinking too much about it, so I guess there’s something to be said for the marketing there. The mystery of who Massacre is is solved, in a fairly shocking fashion, though the book then features four more issues that don’t reference this at all. Made me feel a bit like “Wha?” there – though I’m very much going to get Enemy of the State to see if this storyline continues. There are a couple of fairly odd moments in the rest of the book. We have a two-part story that follows Batwing’s aide Matu Ba (Batwing’s Lucius Fox) in trouble, where Batwing calls in the Justice League International to help. I feel a bit like I might be missing some tie-in there, but anyway. They manage to rescue Matu Ba from Lord Battle (most of Batwing’s enemies so far have had silly names, but whatever), exposing a plot that somehow had the involvement of the Penguin. I have to be honest, I didn’t quite follow that one, but I’ve always liked him since Danny DeVito took on the role, so it was nice to have him included all the same. The book ends with a sort of throwback-story where we learn yet more of Batwing’s backstory, a short issue that felt highly similar to that at the end of the Flash volume two. I’ve finally gotten round to watching the TV series, you guys! I honestly don’t know why I hadn’t gotten round to this sooner. Perhaps because I couldn’t make it through the first episode of Arrow all those years ago, and thought it might ruin my favourite superhero… Well, anyway, three weeks ago I sat down to give it a go, and since that first episode I was just bowled over by how awesome it is! I’m currently trying to pace myself, as I’m watching it on DVD so don’t want to run out of good stuff too soon. I think I’ve watched about half the first season so far, getting up to Fallout last night. So far, it’s been amazing, and pretty much every episode has had me both laughing out loud and glued to the screen. 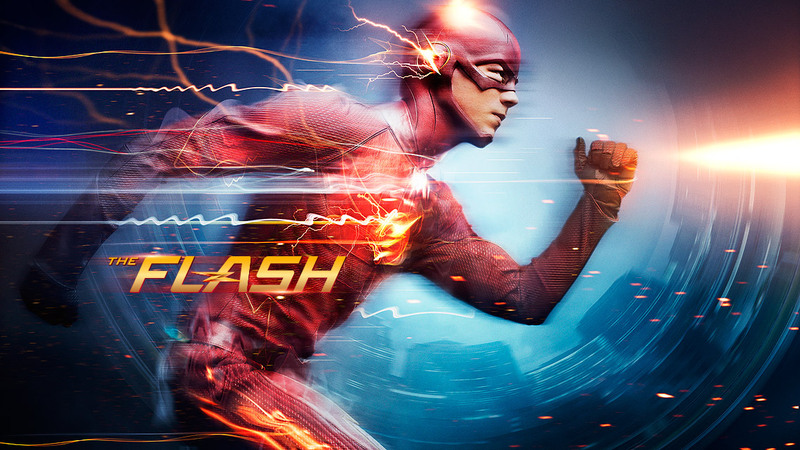 I have to say, it’s rare for me to find a show these days that I can instantly fall in love with, and simultaneously want to just watch it all, and also pace myself and savour it forever, but The Flash has certainly got me hooked! This weekend at WonderCon, DC have given the details on the new Rebirth event that will be kicking off this coming May. io9 have helpfully collected a number of tweets from DC’s Twitter account showing the new books coming out under this banner, and while I’m pleased to see Flash continues with his own series (given he’s already had a Rebirth story, I was a little concerned he might not make it), I’m so excited to see Dan Abnett will be working on a new Aquaman story! Of course, I was bowled over by how awesome Geoff Johns made the character, so it’ll be a hard act to follow, but this should be pretty great, and I’m certainly looking forward to it! I prefer to read these things in trade paperback form, but I’m really interested in seeing what this is all about, so have preordered the inaugural issue there… Exciting times! Pingback: Suicide Squad and more!